Take a tour of the 'Pink City of India', and explore the beauty of Jaipur and its majestic monuments. Explore the key attractions in Jaipur on this tour. See the famous Amer Fort, Hawa Mahal, Jantar Mantar and many more during your tour. Travel in private air-conditioned cab driven by a professional driver. 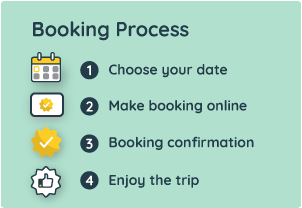 Hassle-free instant online booking at best available price. Jaipur, the city known for its royalty is the capital of Rajasthan. The monuments here and architecture gives a glimpse of the taste of Rajputs and Royal families who used to live in Jaipur. Jaipur, the pink city is globally renowned for its ancient history and coloured gems. This fast-growing modern city is counted among the three corners of the ‘Golden Triangle’ which are Delhi, Agra, and Jaipur. Besides its ubiquitous pink colour, the Jaipur’s culture is very well witnessed through visiting the captivating monuments like City Palace, Amber Palace, Nahargarh Fort, Jaigarh Fort, Jal Mahal, and Birla Temple etc. on this private sightseeing tour of Jaipur. It’s not just these beautiful monuments will give you the feel of ancient history, local sightseeing to the bazaars, elephant ride to the fort and the popular street food of Jaipur will also charm you. In this Jaipur Day, Sightseeing Tour experiences Rajasthan's culture and see its most famous attractions. Your tour will begin with a pickup from your hotel/residence in Agra at your specified time slot. You will be travelling a distance of approximately 240 km and it would take you about 5 & half hours to reach Jaipur. After the completion of your tour, you will be dropped back at your hotel/residence in Agra. Pickup and drop-off to hotel/residence. Charges for the private air-conditioned cab for 2-days and 620 km limit. Parking charges, toll charges and interstate taxes (If applicable). Monument entrance fees or tickets. Anything not specified in the inclusions. The pick-up & drop off location can be different but extra charges will apply as per distance from pick-up location and can be paid to the driver directly. There is a time limit of 2-days and 620 km on this tour, so please plan your stops accordingly. Sedans car model can be Suzuki Dzire/Toyota Etios/similar. SUV car model can be Toyota Innova/Mahindra Xylo/Suzuki Ertiga/similar. The guest can exceed the tour limit on giving additional charges as per your car option selected. For Sedan (4-seater) - Rs. 10 per km (to be paid to the driver directly). For SUV (6-seater) - Rs.150 per hour and Rs. 13 per km (to be paid to the driver directly). Hotel/Residence in Agra city limits.